The hotel offers twelve rooms and three suites. This small size ensures a high level of comfort and personalized treatment. Far different from the usual standardized hotel chains, the Masandoïa hotel offers services that are tailored to the individual needs of each guest. 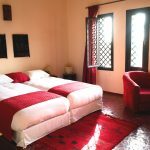 Each of our large rooms (twin or double, smoking or non-smoking) is decorated with care and combines the charm of traditional Moroccan decor with a more modern design. All of our rooms are comfortable and cosy and are bathed in sunlight throughout the day. 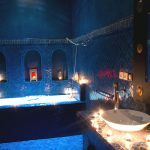 After a relaxing hammam session, spend the rest of the day lounging about in the comfort of your room and do not forget to take advantage of the mini bar and basket of fresh fruits offered by the hotel. Each room is soundproofed and equipped with air conditioning, soft bedding and perfumed candles to ensure maximum relaxation after a busy day spent exploring the desert. Hotel rooms also feature direct telephone lines, free Wi-Fi and flat screen televisions with satellite cable. 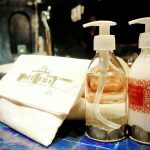 Our bathrooms are without a doubt our most famous characteristic. Each is designed following a traditional Moroccan form of art called zellige, which is used to decorate rooms using stunning mosaic tiles. 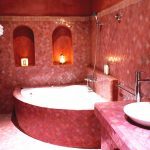 Majorelle blue, pink, ochre, and other warm colours, each individual bathroom offers a different ambiance and is equipped with both shower and bath. Laundry and room service are available 7 days a week from 6h30 A.M. until 11h30 A.M.